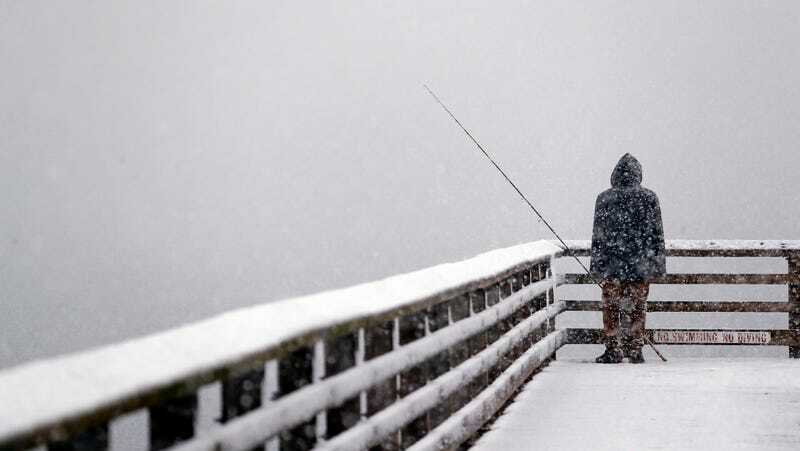 A person looks out toward the cityscape lost in a whiteout as he fishes from a pier during a snowstorm Friday, Feb. 8, 2019, in Seattle. As the Pacific Northwest hunkers down, huddles up, and prepares to be pummeled by snow, Washington Governor Jay Inslee has declared a state of emergency and warned the state’s residents to avoid driving in what could be one of the most intense snowstorms the state has seen in some time. Hundreds of flights were canceled or delayed in the Seattle area as of Friday evening as the Seattle-Tacoma International Airport reported more than 4 inches of snow, according to the National Weather Service. And it may not let up anytime soon: Snowfall is expected through the evening and into Saturday. The frigid temperatures and nasty weather that have gripped Washington this month have created a potentially life-threatening problem for those in the area without a roof over their heads. The Seattle Times said Friday that the King County Medical Examiner’s office reported its first death attributed to hypothermia after a man was found at one of the city’s light-rail stations earlier in the week. The paper reported the 59-year-old man may have been homeless. Seattle officials expanded shelter spaces for adults and families in preparation for the nearing storm, with King County Executive Dow Constantine saying at a news conference that if anyone comes to a shelter facility, “we—the county, the city—we will find a place for you to be safe overnight,” according to the Times. People in the Washington area are being advised to “limit” time outside and keep off roads if they can be avoided, Inslee said. Anyone who absolutely must travel and becomes stranded or trapped in their car is advised to stay inside the vehicle rather risk braving freezing temperatures. The Washington State Department of Transportation also noted that anyone behind the wheel during the snowstorm should use extreme caution around those working to keep roadways safe.